I’m suffering from “BNF” (bad news fatigue) today, so I thought I’d post one or two entries from my little 5″ x 8″ sketchbook that I’ve been keeping lately. Every day I walk my little Chihuahua, Kelso, at our local park or sometimes the library, like I’ll have to do this weekend when Oktoberfest mania has taken over our usual haunt. If I find something of interest, I’ll snap a photo of it and do an ink, watercolor, and marker sketch from it later when Kelso isn’t tugging at the leash to get going. 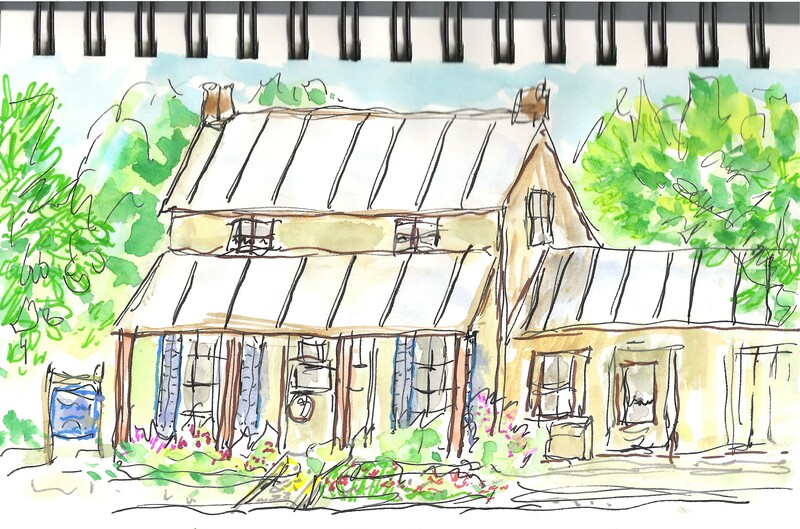 This one is of an antique shop called The Farmhouse across the street from the park. It’s in an old limestone building with a standing seam metal roof. I like to do these sketches quickly (maybe 15 mins.) so I won’t agonize too much over the details, which I’m prone to do. Besides BNF there’s always OCD.